A golden sun edges over the mountain’s ridge and puffy clouds begin to dot a creamsicle colored sky. They create shadows and add depth to the thousands of prickly pear and saguaro cactus around me. I ‘m on my way to breakfast, albeit sitting a bit catawampus in the saddle, as my mount and I climb a precarious rocky limestone hill. 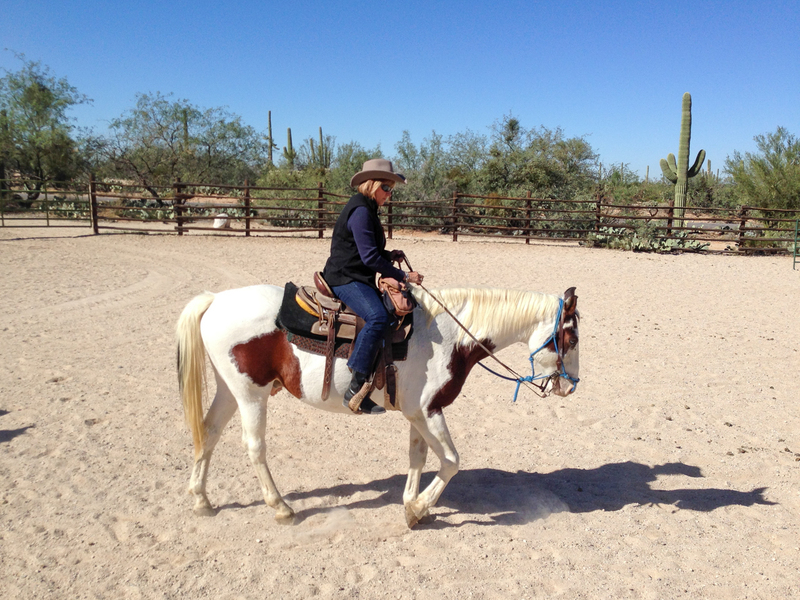 After three days at Tanque Verde Ranch, I feel accustomed to straddling a horse and almost like a real rider in the Old American West. Uno, my trusted steed, takes the downhill with meticulous care, as if his life depends on it; and it does. One slip on this treacherous terrain and he could break a leg and I could go flying over the edge. Soon, we again ascend the steep stony rise. We crest the prominence and I see what looks like a movie set; horses tethered to a rail beside a windowless old homestead. Across the way, picnic tables covered in red and white plaid scatter the summit. Ranch hands work behind a wood burning outdoor grill, cookin’ up a cowboy grub. I’ve earned my plate of sweet smelling blueberry pancakes, eggs, potatoes and coffee that grace the menu at this panoramic tableau. A Boomer, I grew up in the East. As a child, I watched lots of Western television shows: Bonanza, Maverick and Rawhide. I loved the comedy film, City Slickers, pitting middle-aged urban men against the odds of a cattle drive, but I’d never been to a dude ranch. Nowadays, I live in Florida and, while no Southern belle, I’ve no background in riding (although I did manage a well-trained mule around the rim of the Grand Canyon). To me, horses are very large animals with big teeth. They look beautiful in a pasture, but rather scary up close. Nonetheless, I’m always up for a new adventure, so even in my sixties, I chomped at the bit when offered a chance. What exactly is a dude ranch? I found the word “dude” goes back to the 1870’s Yellowstone Park rangers who created the term to refer to visitors from the East. By the 1880s, it referred to anyone who was not a resident of the Rocky Mountains. 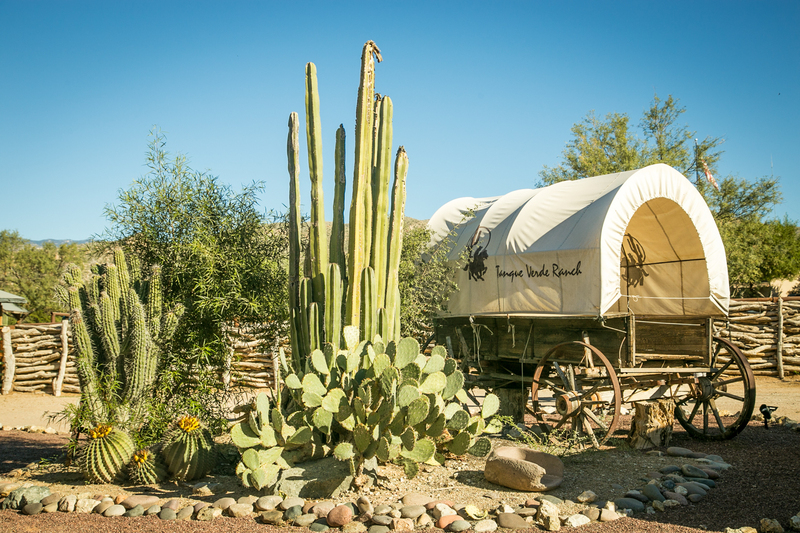 By the 1920s, the definition changed to anyone who hired a guide or paid money to stay on a ranch. This definition continues today; any ranch that takes on paying customers for tourism or income is considered a dude ranch. 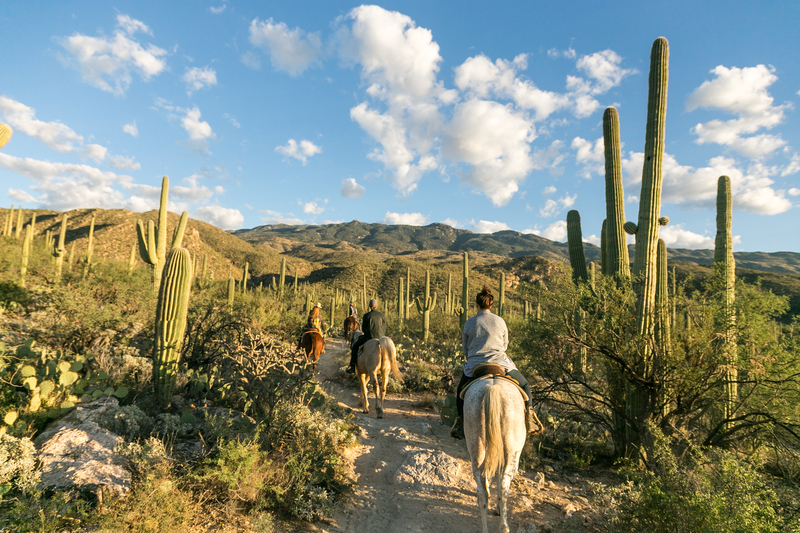 Tanque Verde Ranch, about 30 minutes from Tucson, Arizona airport, is the nation’s largest dude ranch, nestled among the Rincon Mountains, spanning 60,000 acres. Nearby recreational areas include the Saguaro National Park and the Coronado National Forest. The resort provides airport shuttle service for all guests. 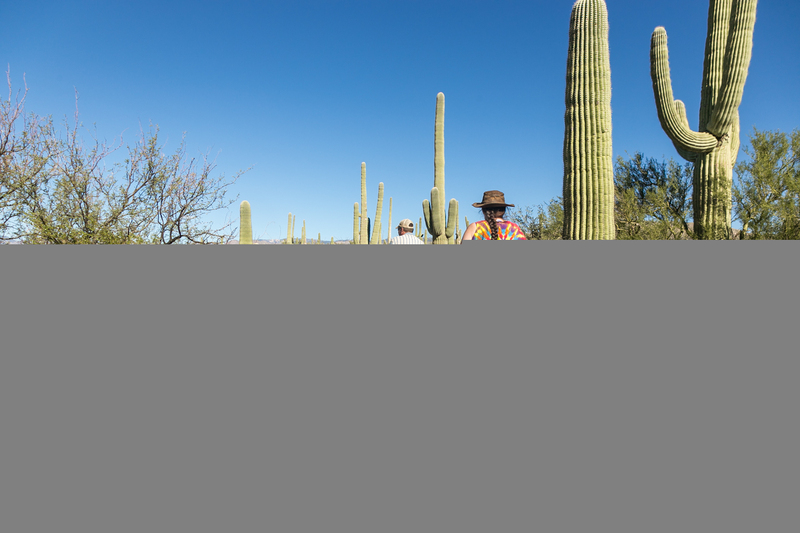 Along the way, “Cowboy Joe,” the driver, wearing a cowboy hat, points out local attractions and explains that the protected species of saguaro cactus grow very slowly. “They don’t get their arms until their 75th birthday,” he said. A far cry from Florida palm trees, these huge cacti, along with other smaller ones, some mesquite and cottonwood trees, and desert broom are about all that manage to live in rocky Sonoran Desert. Roughin’ it? Hardly. I determine my stay at this adult camp setting will be pretty plush. My room includes two queen sized beds, a round table for dining or working, two leather chairs facing a real wood-burning fireplace and a living room and patio with plenty of lounging space; perfect setup for a family, too. However, Tanque Verde offers no in-room televisions. Guests are encouraged to talk to one another, play cards, attend an evening activity or sleep after a full day of activity. I totally agree with that philosophy, but for those who must, TV’s are found in the lounge and the bar. After a catnap (I’d flown cross country), I tour the property with a group I’ll join for the next few days. 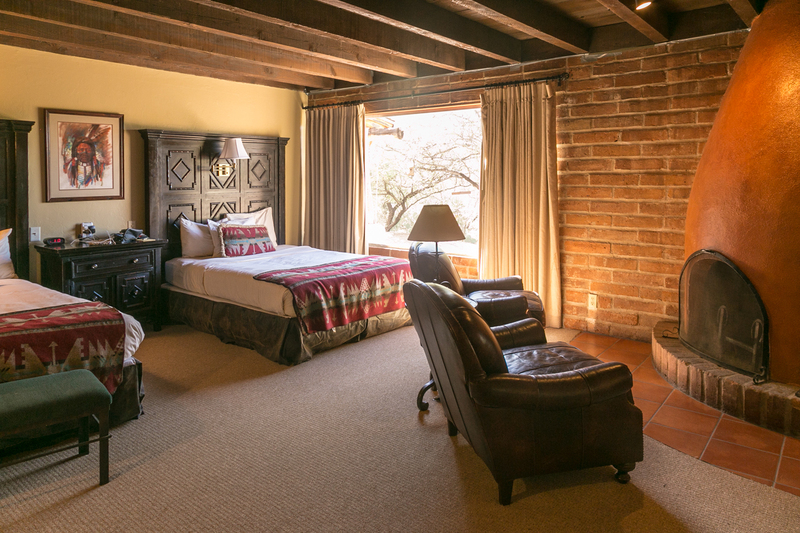 We discover sixty-nine guest suites scattered over the sprawling ranch. The daytime stable and pens seem endless, with over a hundred and eighty horses ready for riding. I visit the indoor and outdoor pool, 24-hour hot tub, a library, lounge and dining hall. 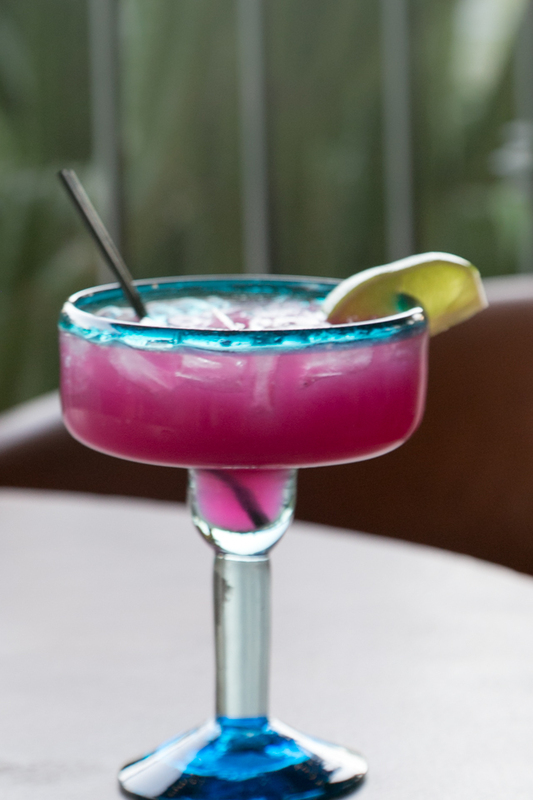 Never too early for a drink, the Doghouse Saloon barks to me and the house special, a prickly pear margarita, calls my name. Prickly pears are fruits from the spiny cactus that must be carefully picked with gloved hands. At Tanque Verde, they squeeze and filter the juice, then store it for later use. The rosy hued cocktail tastes somewhat sweet and tangy, but with a bit of punch. By jingo, after two, everyone seems to unwind. We mosey over to the dining hall and order dinner off the menu. And it’s not just bacon and beans. Next morning, I awake early, eager for my first riding lesson. Others in my group have prior experience, but we all attend a horsemanship clinic. 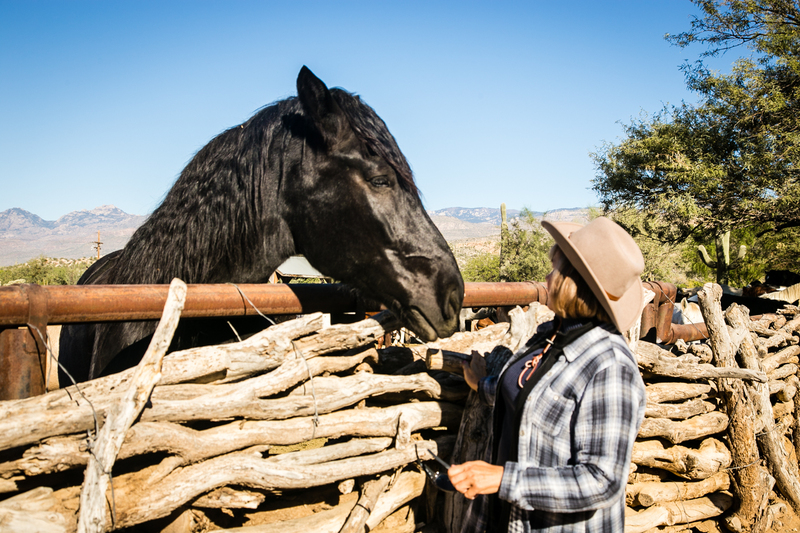 One of the wranglers, whom I named Slim, explains equine behavior, saying, “Horses pick up your vibe.” He encourages us to emote positive energy, but keep after the animals until they do what you want. ‘Right,’ I think. I saddle up and hear more instructions: pull the reins to the right to turn right; pull back to stop, keep pulling and the horse will start to back up. Make a tsk tsk sound by clicking your tongue, and gently kick the horse with your heels to get going. These rules all make sense, but when one isn’t used to commanding a beast this size, pretty overwhelming. I follow on Jeremiah, walking in head-to-tail fashion until the group gets to a training corral. 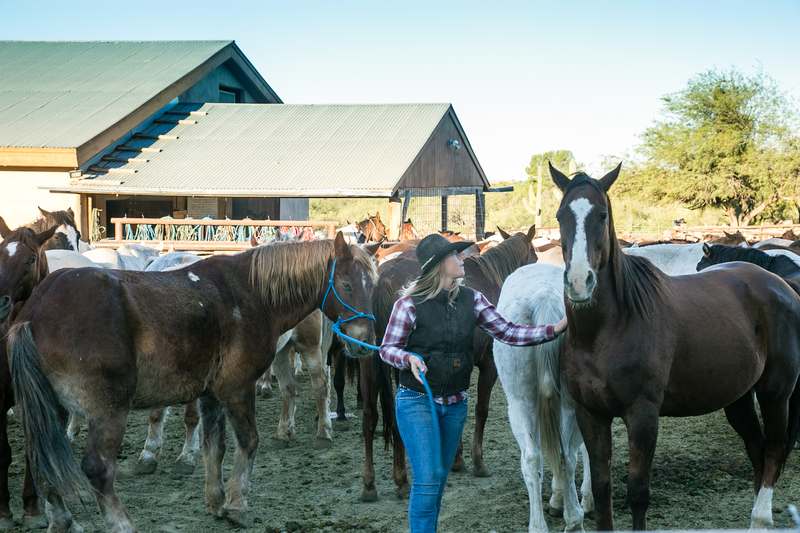 The wranglers tell us to face forward and to ride, one at a time, around the barrels. In other words, make the horse follow my directions. At this, my short-lived joy abruptly ends. I am an absolute failure. Now that Jeremiah and I are no longer following others, he won’t budge. Then, he begins to turn in any direction he chooses. Slim encourages me, but Jeremiah senses my negative juju, my lack of control. I become tense and frustrated, as does my mount. “Ease up on the reins” say the instructors, but they decide it’s time to switch me to another horse. Starting over, I heave my body up and onto “Uno”, a painted pony with brown splotches and endearing eyes, one blue and one brown. Uno’s calmness immediately lessens the tension. He seems to want to listen and actually allows me to ride him around the corral. I sense relief and improvement. Two more walking rounds and the instructors are ready for the gang to move on to trotting. Yikes, trotting is faster and causes the rider to bounce wildly up and down in the saddle. I feel like a hard “super ball” hitting a slab of concrete and flying up; it is fun, but my buttocks and back take a pounding. I begin wishing I’d foregone that second cup of coffee at breakfast! “Loping is easier on the rider,” Slim announces, and I somehow move Uno from a trot to a lope, however briefly. Amazing progress indeed, but others in the class vote to finish the session with a walking/trotting trail ride. In my brain, that means letting loose like a full gallop. Oh dear! The ride turns out to be glorious. We thread through the dry cactus- filled desert at a reasonable gait. How the horses’ hoofs miss getting jabbed by the large nasty looking pricklers, I don’t understand. Sometimes, Uno tries to munch on nearby foliage, and the trail leader yells back at me,”Pop his head up.” Easy for her to say, his head is dead weight to me. We ride up and down small hills, across a dry riverbed and beside a lake. We trot through a grassy meadow and Uno generally behaves. Whew, I am happy. Lunch is an appetizing reward, filled with healthy options. Afterward, the hot tub calls this greenhorn, as I am already saddle sore, and my muscles crave a dip. An outdoor yoga class follows, held on a deck overlooking desert flora and fauna. I pinch myself with joy for participating in the full roster of activities. 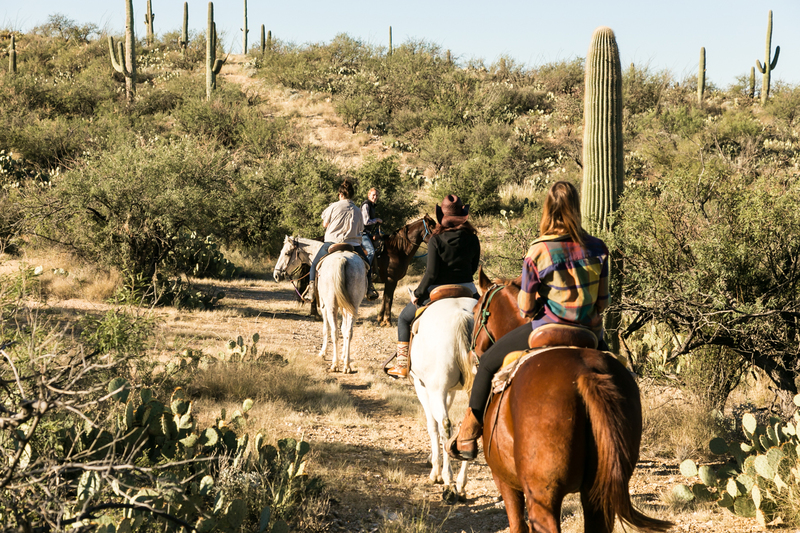 Besides riding, Tanque Verde offers fishing, mountain biking, tennis lessons; basketball, volleyball, photography hikes; birding; and nature walks, plus a spa. But I have no time. Soon, I am back in the saddle for a two-hour sunset trail ride. This outing pushes my skills to the max, but becomes a spine tingling, memorable adventure. 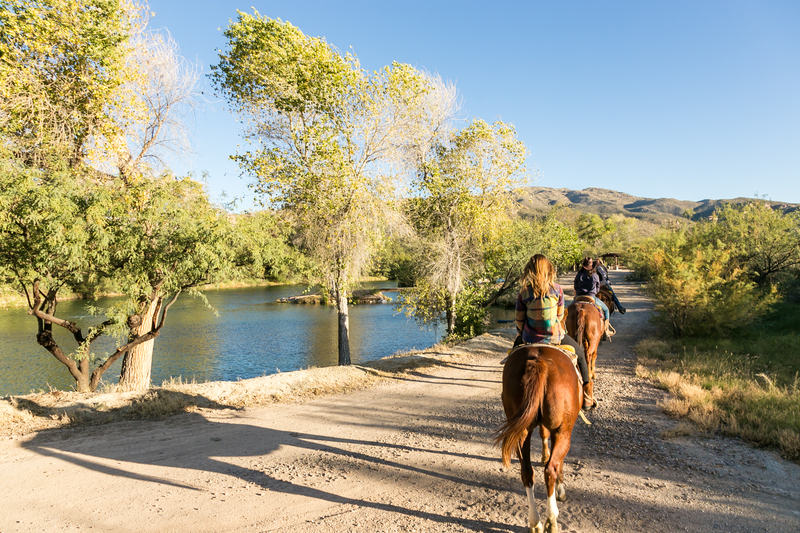 My group on horseback strolls through the cottonwoods, and then ventures up high mountains on steep paths, barely wide enough for the horse’s feet. I can’t comprehend how the animals master this trail. Riding downhill is even more dangerous. Uno very carefully places his feet on the rock-strewn path, making sure his footing is secure before taking the next step. I hang on to the saddle horn for dear life. When I let myself, I look up and glimpse a picture perfect silhouette of riders against a stunning sky, a scene from National Geographic come to life. The moon begins rising above eastern hills, and the sun slowly sinks in the west. Blurry swatches of orange, peach, red and yellow paint the horizon. In the distance, giant saguaro cactus stand in black profile, like sentries guarding gates. By the time we return to the stables, the trail looms pitch dark, but Uno knows the way. Tanque Verde has made me live in the moment and bestows a sense of pride, and perhaps even a desire to conquer this sport. Before bed, we attend a star-gazing class with an astronomer. He has a green laser that points out constellations in the dark sky. He lets me take a photo of the moon with my smartphone through this telescope. Pretty amazing, right? 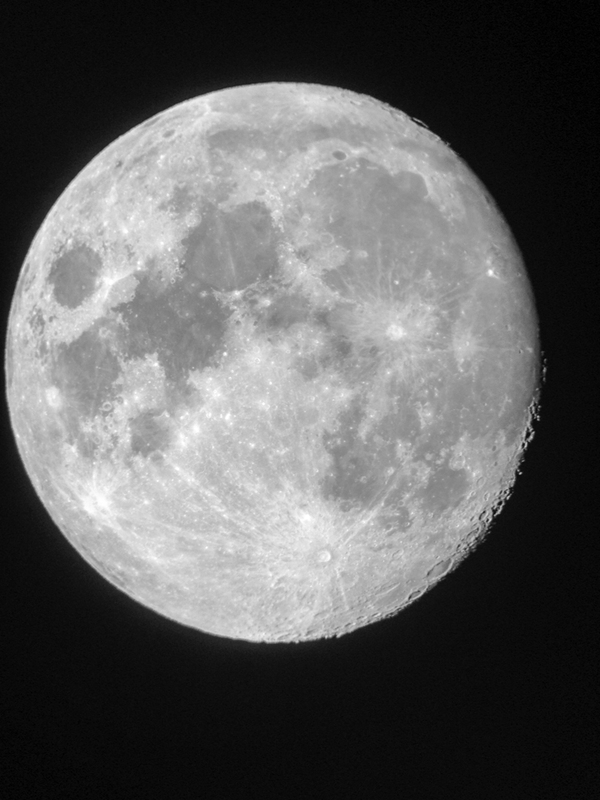 The moon as photographed in my star gazing class. Generally a glutton for punishment, I chose an hour walking trail ride before our class lesson the next morning. I enjoy the glorious view all around, but work up a few more saddle sores. 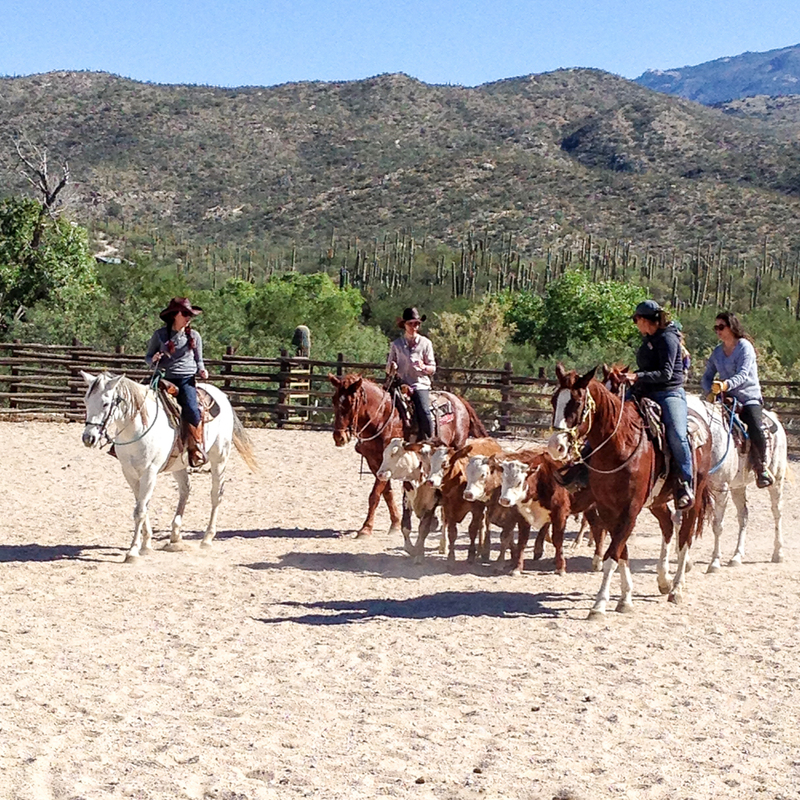 Our group class is scheduled for team penning, a cattle herding competition. Five young cows enter the corral, and we work in teams of four to round them up and move them into pens at the opposite end. Thankfully, other riders in my foursome are more proficient, but I hold my own. We move those doggies into the pens for five rounds, and my team is declared the winner. Yippie-yi-yo-ki-yay! After lunch, I need a break from horsemanship, and take a water color class, like camp arts and crafts time. I could have listened to a naturalist speak on venomous species and taken a hike, but I skip those! Later, the group competes at a margarita/salsa making contest. We jointly create a fantastic spicy salsa with an array of peppers and pineapple, Our margarita includes cucumber juice, fresh lime juice, tequila and is rimmed with zesty salt. We place second. Off we sashay for an outdoor BBQ chicken and ribs dinner in the Cottonwood Grove. Here, couples cozy up to the fire, or kids roast marshmallows while a western singer serenades. After dinner, line dancing to Boot Scooting Boogie takes center stage. Wow, I’m becoming a cowgirl and really having fun. I sleep well. The sunrise breakfast trail ride begins my third day of riding, and the meal is perfect; cooked to order eggs, blueberry pancakes and bacon. We sit against the stunning spectacle of Saguaro National Park. The ride back to the stables will be my last, and now I’m sad. I might not have taken to the life of a cowboy like a horse takes to oats, but I have surprised myself. I can certainly understand why 85% of Tanque Verde’s participants become return customers. Guests come back because they feel the warmth of genuine hospitality and customized care. They value a well-managed program and professional staff. 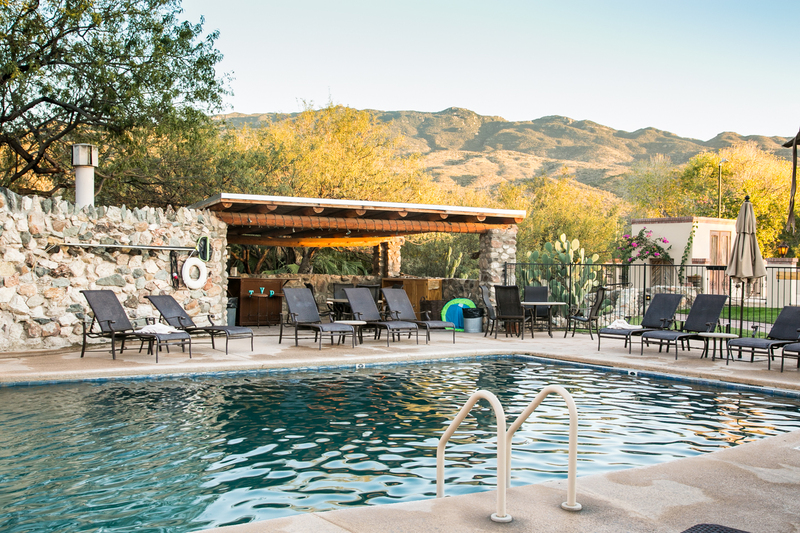 They find Tanque Verde Ranch outstanding in every way. I’d love to return for this out of the ordinary experience that I’ll talk about for years. 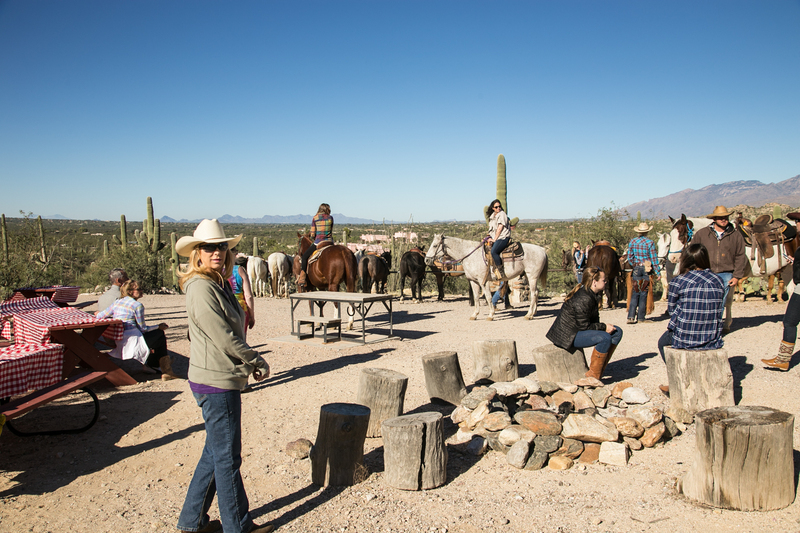 Disclosure: I was hosted by Tanque Verde Ranch in order to write an article for a meeting planners magazine. The above story, written for Luxe Beat, is my personal account of the experience, which was positive in every way. I had a blast! 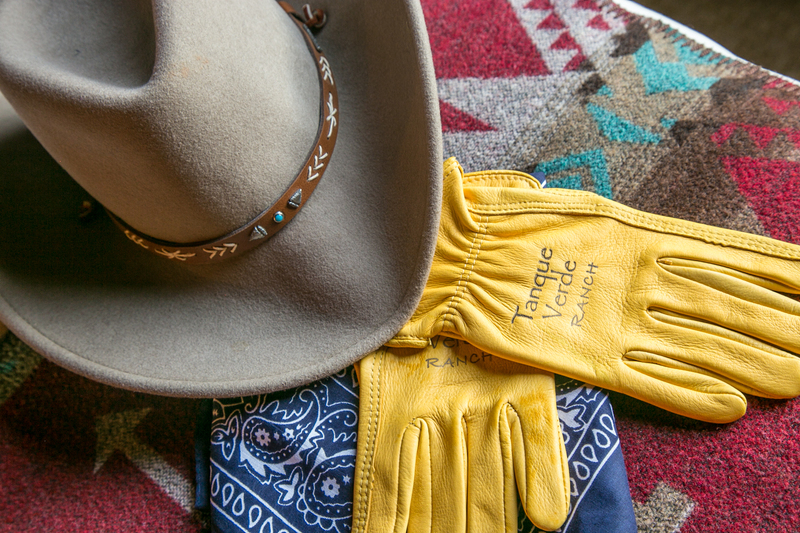 Many thanks to the fine folks at Tanque Verde Ranch. NextEating Around the Kenya Bush!